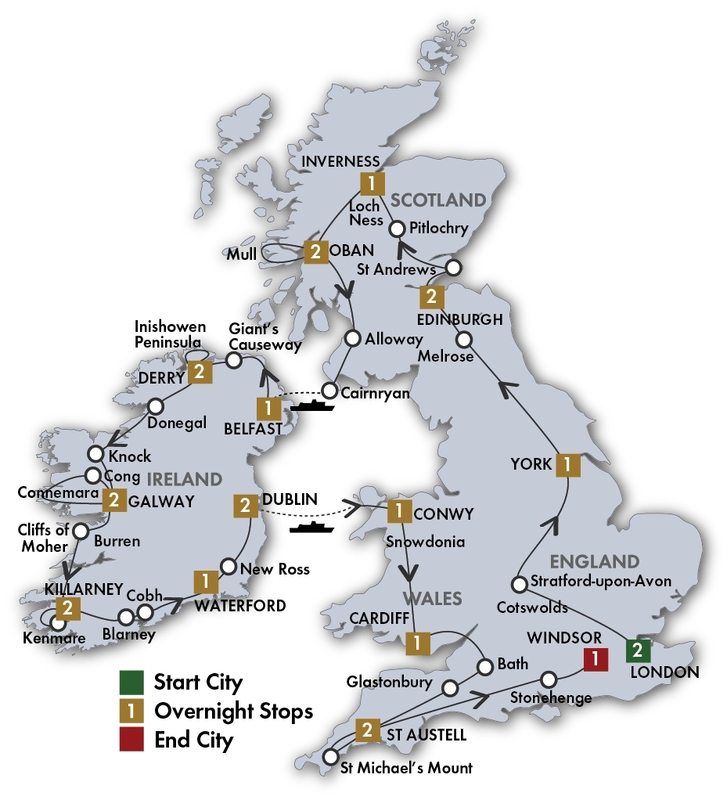 To find your ideal vacation, browse our comprehensive selection of guided coach tours to Britain & Ireland that vary in length from 8 - 24 days. Choose value-for-money first class programs, splurge with deluxe properties or find something in between. All of our quality escorted coach tours to Britain & Ireland feature prepaid daily sightseeing, excellent hotels, full breakfasts, most dinners, including specialty dinners with entertainment and, most importantly, no hidden extras! Our tour guides do not sell any optional tours so that they can focus 100% on your vacation enjoyment! Select tours below offer you this exclusive experience with an average of just 24 guests on select departures. Also consider one of our popular vacations combining Britain and Ireland with Scotland and Wales. If you need help in deciding which tour is right for you, just call us at 1-844-231-9285 to discuss with one of our friendly CIE Tours travel advisors. Please browse our wide selection of Britain & Ireland tours below. Also consider one of our popular vacations combining Britain and Ireland with Scotland and Wales. If you need help in deciding which tour is right for you, just call us at 1-844-231-9285 to discuss with one of our friendly CIE Tours travel advisors. Please browse our wide selection of Britain & Ireland tours below. 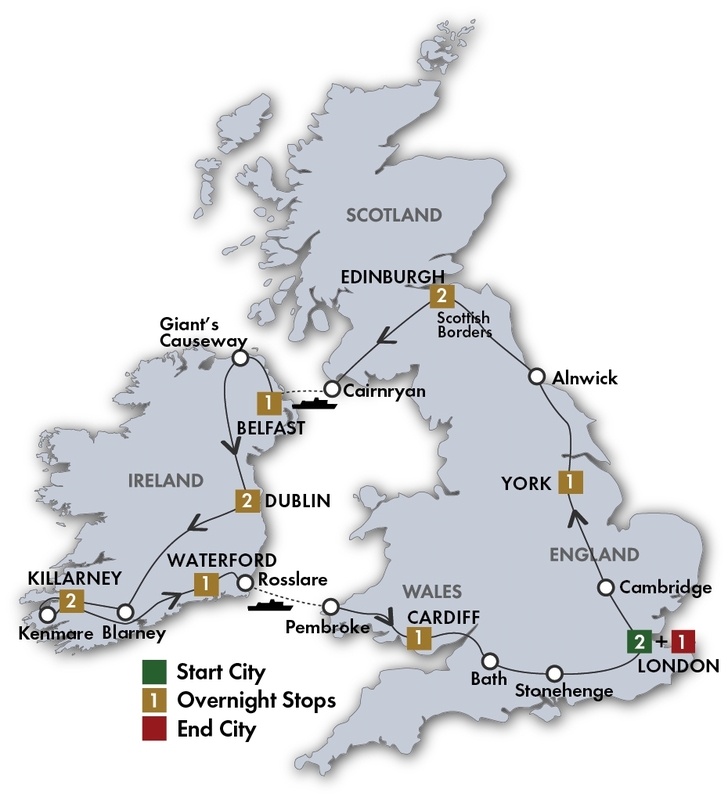 This tour focuses on the popular towns and sights throughout the south of Ireland, Wales and England. Start in Dublin and visit Galway, Cliffs of Moher, Killarney, Blarney and Waterford. Cross to Wales to stay in Cardiff, tour the Roman Baths & Pump Room as well as Stonehenge before ending in London. Discover cosmopolitan London, the Beatles’ Liverpool, the tranquil Lake District and in Scotland explore Edinburgh and St Andrews. Head into the Highlands for unspoilt scenery and cruise Loch Lomond. 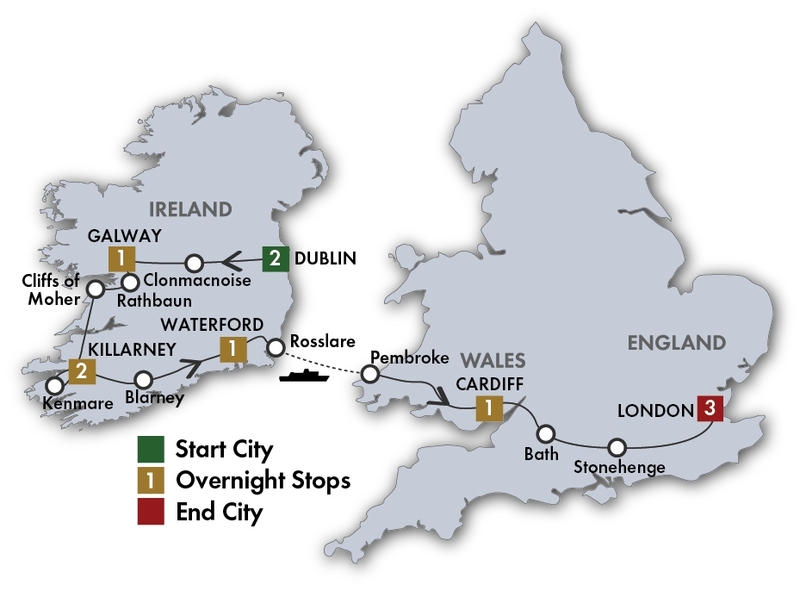 Take a ferry to Ireland to Dublin, Blarney, Killarney, Dingle and the Cliffs of Moher. Great hotels and meals, including 4 special dinner/shows. 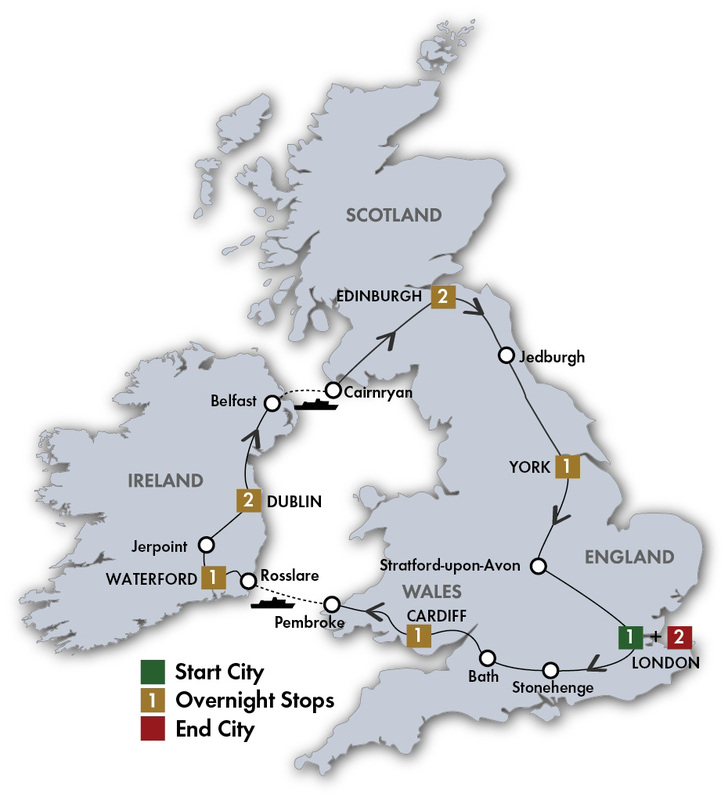 A great in-depth tour starting in London and ending in Dublin. Visit Shakespeare’s Stratford-upon-Avon and historic York before heading north to Edinburgh with its dramatic castle. Continue to St Andrews and through the Highlands and the Isle of Mull. 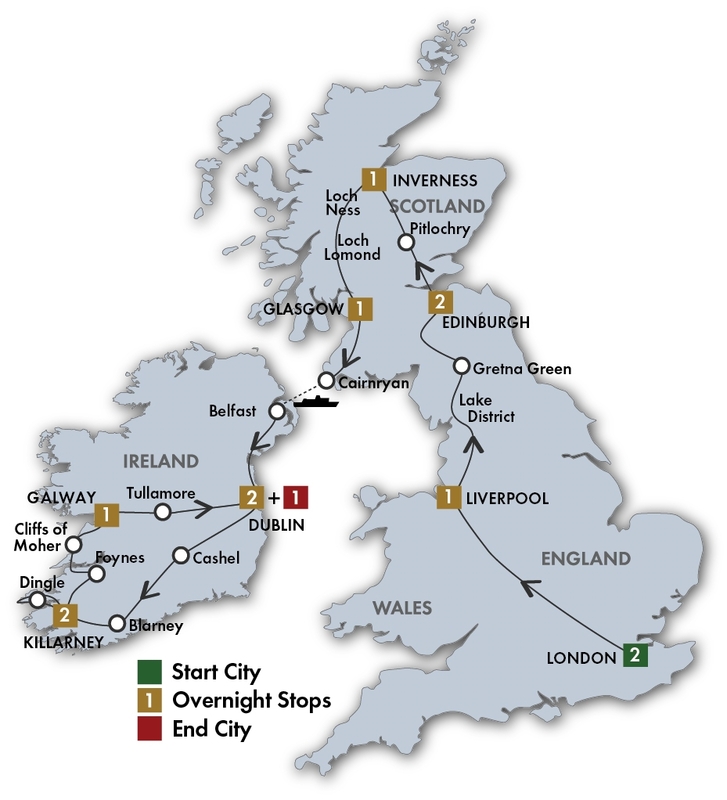 Cross to Belfast by ferry and travel around almost the entire Irish coastline with daily sightseeing. A great introduction to England, Scotland and Ireland. See the sights of London, enjoy evenings of Scottish and Irish entertainment, watch a sheepdog demonstrate how he herds his his flock. Visit the Lake District, Blarney Castle, Cliffs of Moher, Edinburgh Castle, the Beatles’ Liverpool, and much more.